Our challenges with this fall into two major categories – a first, which today we are easily able to remediate, and a second, which it’s much more challenging to address. Another book I have been reading recently is Revenue Engine by Steve Woods (Twitter: @stevewoods) and Alex Shootman (Twitter: @shootman) at Eloqua. Their book provides an analytical framework for thinking through the high-level management and optimization of the lead-to-revenue process, and it’s worth a read. Historically, marketing and sales have not been held to the same standards of measurement, optimization, and control that other corporate disciplines have confronted. Why? In a word: visibility. Scientific management was enabled by the ability to observe a worker, measure and time the tasks performed, and refine them accordingly. The tracking innovations in logistics and warehousing meant that analysts could track each package, each movement, and each shipment to a granular level, which gave rise to supply chain management. And the ability to precisely and automatically measure defect rates and manufacturing tolerances meant business could feasibly embrace and implement the total quality management discipline. Unfortunately, that hasn’t typically been the case with marketing initiatives or sales conversations that have long eluded meaningful measurement. Without the ability to see and measure the progress of buyers, it has been virtually impossible to systemically optimize the performance of the revenue creation process. Until now. Unprecedented transitions in buyer behavior and online access to information over the past 10 years have enabled, for the first time, the management and optimization of the entire revenue-creation process. The same Web 2.0 world that has complicated buyer communication – challenging us as B2B marketers – also has delivered more mechanisms than ever for observing what Woods has termed “Digital Body Language.” I.e., more than ever, we have the tools to observe a buyer’s substantive interaction with our companies throughout the entire buying process. This capability is critical because leveraging trackable insights is at the core of our ability to optimize B2B demand generation and leads to what Woods/Shootman would term a state of more ‘scientific’ lead-to-revenue management. So connect up inbound marketing and social media tools with marketing automation and a CRM platform, and you’ve got end-to-end tracking of much of the B2B buyer journey via his/her consumption of digital content. Okay, problem number one solved, right? … but yet we know this is not sufficient. Merely adopting platforms such as marketing automation gives us a new level of capability for engaging with B2B buyers, but how do we leverage the technology to efficiently manage the demand process? As I’ve noted in a past blog post, why is it that our adoption of the technology, by itself, does not seem to tackle our problems and that an alarmingly-high percentage of new technology adopters also report overall failures in their B2B demand generation programs? Clearly there is something else – something bigger – that is holding us back from effective management of demand processes. Adam – great post. I agree with your perspective and look forward to part 2 in the series. I also believe there’s a silver lining here – and incredible opportunity for B2B marketers. My bias is based on the fact that I am working with many mid-sized and enterprise organizations (many of which are in the technology and information services sectors) who are clearly embracing today’s challenges head on. 3. Adoption of marketing automation platforms that elegantly integrate with Salesforce.com (or other CRM tools), enabling more relevant conversations between organizations and buyers and providing metrics to prove effectiveness of marketing. Of all these advances, the most important is #1. Brilliant article about improving B2B marketing via process improvements; this is Part 1. @lauren – Thanks for the comment. Couldn’t agree with you more. Particularly on point one. 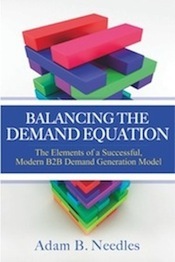 To me, the two guiding principles, and really the ‘balance’ we need to strike in modern demand generation is at once both ‘focusing on the buyer’ at the same time that we’re ‘adopting an operations mindset.’ To me, working out how these two principles integrate is the secret sauce. So agree the buyer-centricity piece is really the doppelgänger to the operations piece we’re discussing here.